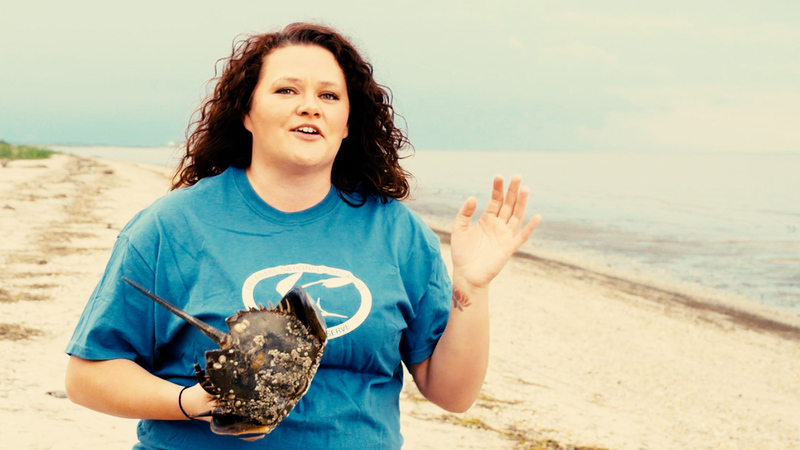 Meet an Education Specialist from the Delaware National Estuarine Research Reserve. She says becoming a scientist is all about being curious! As a kid, my family was the one that would go to every single public program for the National Parks. So at 9 years old I became a junior volunteer at Assateague Island National Seashore. They started a whole programming because of my brother and I. And we would actually help the interpreters do programming. Things like “Marine Explorers,” we would collect animals out of the water, we would do campfires, surf fishing, and just all of that, being around it, I just kind of fell in love with it. I have a degree in environmental restoration and management with a focus on wetlands. I am actually a research scientist by trade. I realized that I liked talking to people better than sitting outside and researching, so I did a lot of work with the National Parks Service doing interpretation, I worked at outdoor education centers, I even worked at NASA teaching rocket science, because hey, why not? Just three laws of physics, you got rocketry. And I’ve also worked with doing wetland monitoring and assessment, to study the health of our wetlands. Which kind of led me into the reserve, where I kind of got pulled into the horseshoe crab. I didn’t know much about it, and in the last two years, I’ve learned so much about it and gotten so excited, that it’s moved up to my favorite arthropod. If you want to get into science of any kind, go out and just explore your backyard. You may find a mud puddle. Play in it. I promise you, it’s not going to hurt you. Or go to your local creek and find a tree. Maybe it has a new pattern on it that you didn’t know about. And so just keep finding those and staying curious, and whenever you see something that you’re like “I wonder…” As long as you have that “I wonder,” you’re going to do fine. And then once you get old enough, and you really start to be like, “You know, I want to do this for a career,” find scientists and say, “Hey! Do you need help? Let me work in your lab. I will give you my time.” And they’ll take it every time, because everyone wants help. It’s just… it’s so exciting! How can you not get excited about science, that’s all I have to say is like, seeing this, and how it’s evolved and changed and how it fits in with everything else, I feel like, just seeing that is so exciting, because so often we get stuck inside what we are doing. But you go and you sit outside and you see the animals, or you see even the waves coming in on the ocean - it’s just brilliant, it’s exciting, and I will never get bored with it.